The Museum Ethnographers Group conference is being held on Monday and Tuesday at the excellent Powell-Cotton Museum in Kent. The theme is ‘Nature and Culture in Museums’, and the relationship between the two. I am a zoologist by background, but for the last three years I have been immersed in a different world, working on a review of the Anthropology collections at the Horniman Museum and Gardens. I have learned an enormous amount about material culture from all over the world, seen some incredibly stunning objects, and been surprised by how relevant my Natural History knowledge has been. Many of our objects are made of animal materials, and it’s been a great opportunity to learn new skills in identifying ivories, bone, and antler. Only a few weeks ago I was very excited to be able to identify an Inuit flint-sharpening tool as being made of mammoth ivory! I have also been asked to add taxonomic data to some Anthropology object records in our Collections Management System, so that we can record the species that are represented by objects. This provides richer contextual data, and links between objects that can be navigated on our website. Which is actually a Great Auk (Pinguinus impennis). 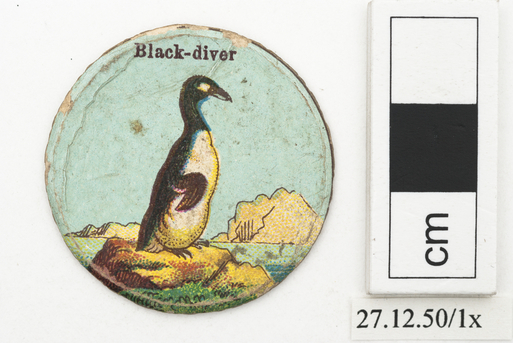 I have never heard ‘black diver’ used as a common name for this bird, but the likeness is unmistakable. The last recorded sighting of this species is from 1852, following the death of the last individuals to be shot, in 1844. 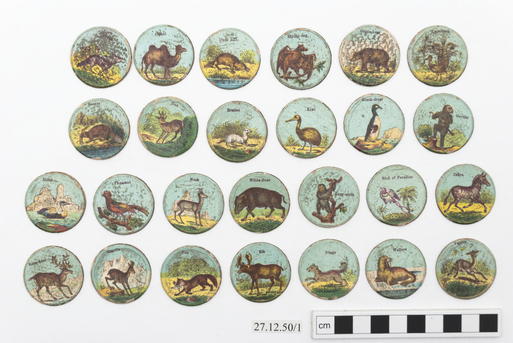 I was intrigued to see this species represented in the pack, and was left wondering whether any of the Victorian children who played with the cards had ever actually seen a live Auk. 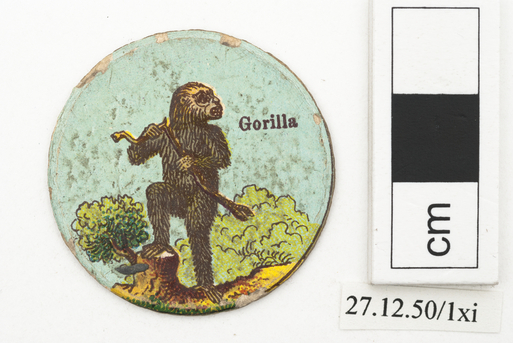 The Eastern Lowland Gorilla (Gorilla beringei) was not described until 1903, so it seems much more likely that this card represents the Western Gorilla (Gorilla gorilla), described in 1847. The date of the discovery of the Western Gorilla, combined with that of the extinction of the Great Auk, could potentially narrow down the date at which these cards were made enormously: there is only a five-year period in which both species were known to exist together, between 1847 and 1852. However, the actual date of manufacture could be much later: following their discovery, gorillas were incredibly popular with the public for many years, particularly in the 1860s after the publication of Darwin’s Origin of Species in 1859, and the first live specimen reached a European zoo in 1876. ‘The Auk’ was taken as the title of the American Ornithologists’ Union’s journal, founded in 1884. 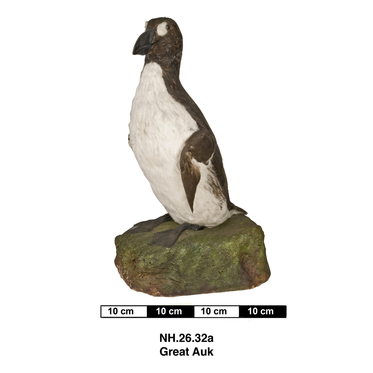 So the Great Auk was clearly still in the public consciousness long after its extinction. 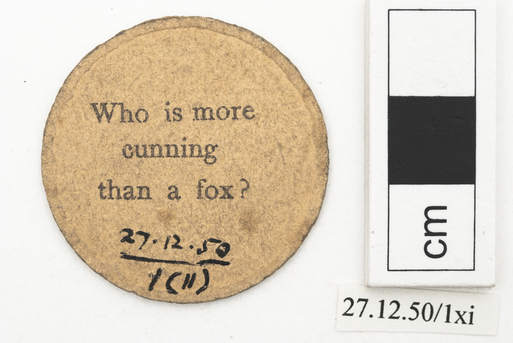 Given this information, it seems quite possible that the original owners of the playing cards may never have seen either species in the flesh! But that is as far as my research has taken me for now. This is a story that I hadn’t expected to find in these objects. As museum professionals, we are custodians of more than just collections: we are the keepers of specialist knowledge that we use to interpret our collections, to tell stories that will engage our audiences. Sometimes, to find their stories, you need to look at objects from more than one perspective. By working across disciplines and sharing our expertise, we can find new tales and new ways to tell them.